Early last week, my special needs kid, who has epilepsy, was having a hard time. He bit off the tip of his finger (just the fleshy part, but still) from anxiety. He kept having seizure after seizure. Eventually, he was rushed to the ER for seizures that were lasting way too long. There, he was altered and sometimes nonresponsive. We spent three long days in the hospital. He is recovering, but still struggling. When we got home, I wasn't feeling so well. By morning, it was clear that I was very sick. My husband drove me to the doctor's office. The doctor could not get me to respond to anything, including pain stimulus, and called 911. Turns out, I was exhausted, dehydrated, had low oxygen levels, and had strep throat. I'm still sick, but better. The oxygen levels were low because of the swollen throat and not asthma, thank goodness. Through all this, you'd suspect that I wouldn't open my planner much. On the contrary, my planner saved my sanity. The notes in my planner helped the doctors to diagnose and treat us. 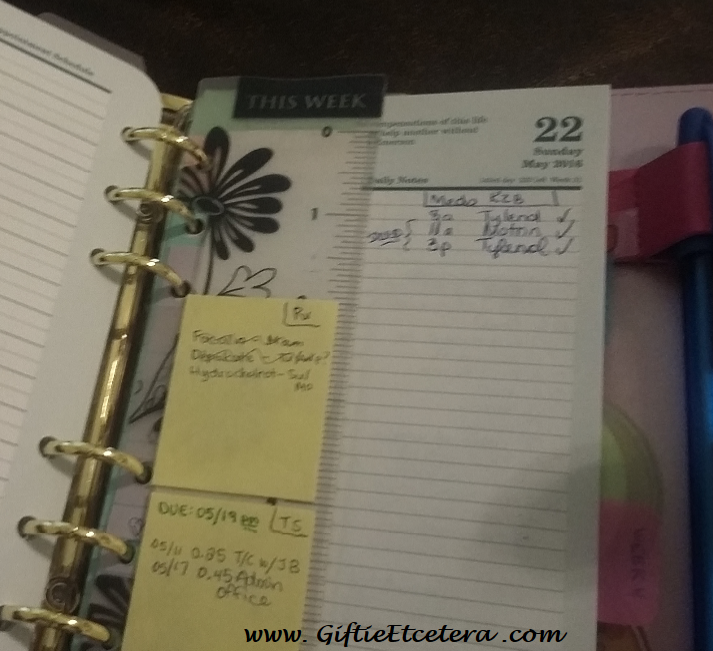 In the ER for my child, I was able to give details on the durations and details of the seizures based on notes in my planner. In the ER for me, while I was passed out, my husband was able to find and give them the medications list in the Files/Notes section of my planner. He looked it up on the planner index while I was unconscious. On the first day that we went to the hospital, I realized I needed a bunch of stuff at home. So I started a list, right on my daily pages. A daily plan lets me stay calm in a crisis, since I don't have to remember everything and can concentrate on the important stuff. In our case, that list meant someone else could run by my house and pack the things that we needed at the hospital. There are things that need to happen, even in the direst circumstances. Having a daily checklist is important for keeping life running smoothly, but it is critical in a crisis. I noted on my daily checklist that I still needed to take my meds and make a prep plan daily, and that someone else had to water my plants. If I hadn't had my calendar, I would have been lost. I had to reschedule doctors' appointments and therapy, arrange backup care for my other child, and generally deal with the rest of life. Having an up-to-date calendar at all times that shows an overview is MORE important in a crisis than any other part of the planner. I blurred the picture on purpose, but all those scratch-outs? Stuff I canceled to be in the hospital with my kid. 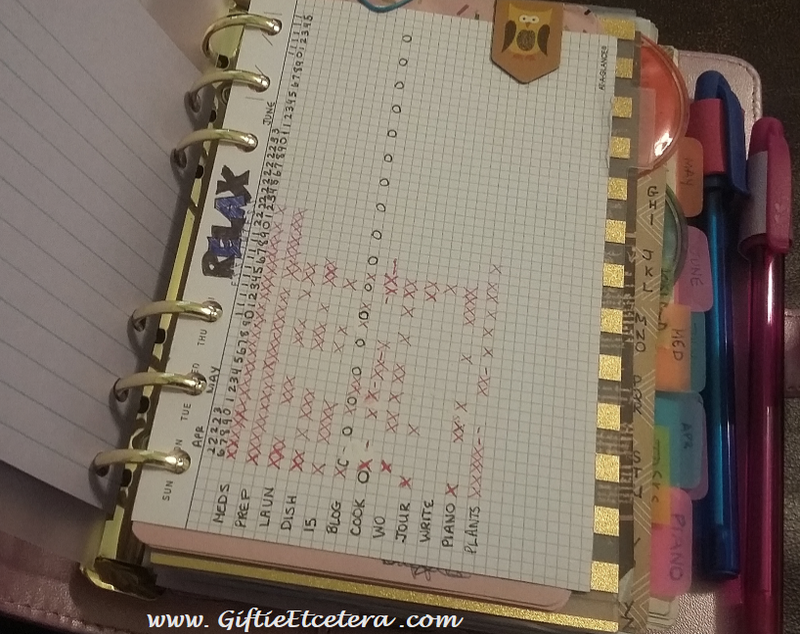 While I was recovering from my own hospital stay, I had to note the times I took my meds. I had to deal with pharmacies and follow-ups. I've never had such a bad memory as during this week. A simple log on a daily plan freed my mind to rest. It's not how I usually use my daily plan, but it worked. 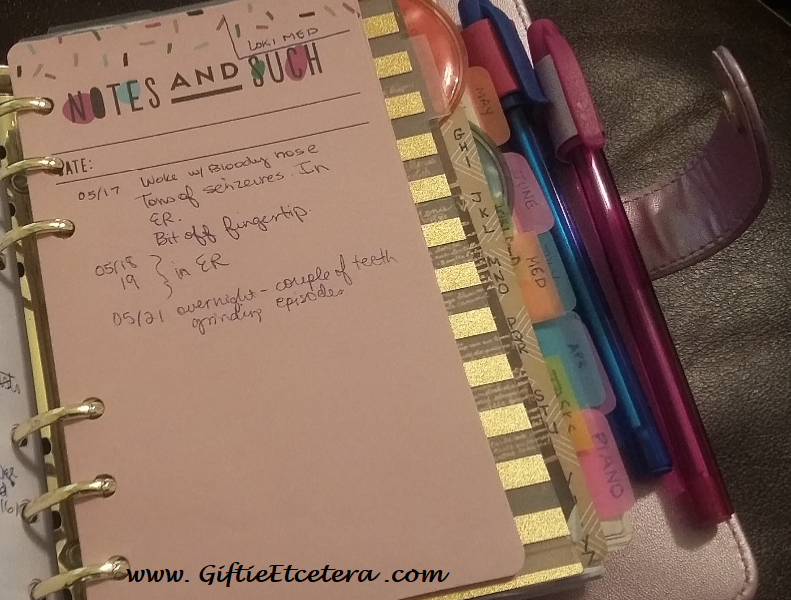 It's important to standardize how I use my planner so that I know where to find and put information, but having flexibility on the daily pages is priceless. We are okay. It will take a while to fully recover, but my son and I both will be better. In the meantime, my planner was the MOST important tool for getting us there. The doctors at the hospital told me my charting was even better than the nurses! Good thing, as it helped us figure out the seizures. If you still haven't set up your planner, take a moment and create one. Learn to use it now, while things are stable. 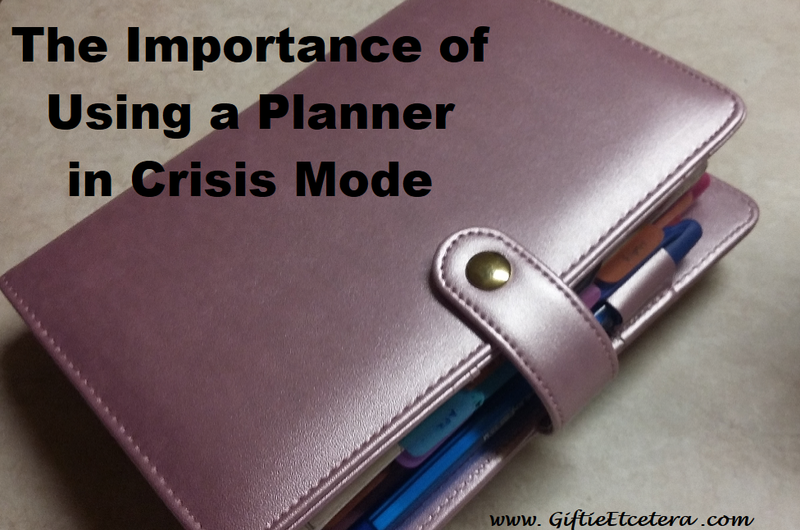 Even if you don't carry a planner, consider an emergency plan - complete with a hospital packing list for family, an extra phone charger (trust me...someone will need this), an updated prescription list, and an updated medical history. If you have kids, have a list of sitters available to call. Consider sitters near your nearest trauma center, too, even if no one close to the family lives there. When crisis comes, you'll be ready for anything. Holy Crow! That was a horrid week! I am really happy that you and your son are on the mend! How scary for you! Keeping you both in my thoughts for speedy healing! Wow! Glad everything turned out OK! Thank you for sharing this even when you probably didn't feel like it. You are living proof that keeping a planner can save your life. This has me seriously thinking about more ways I can improve my own system. I've recently made some good tweaks, but this post is getting the wheels turning again. Hope you and your son continue to feel better. God bless. Kristy, I hope all is well now. Wow, what a crazy week. But everything you tout in your blog about how you keep pertinent information in your planner paid off. 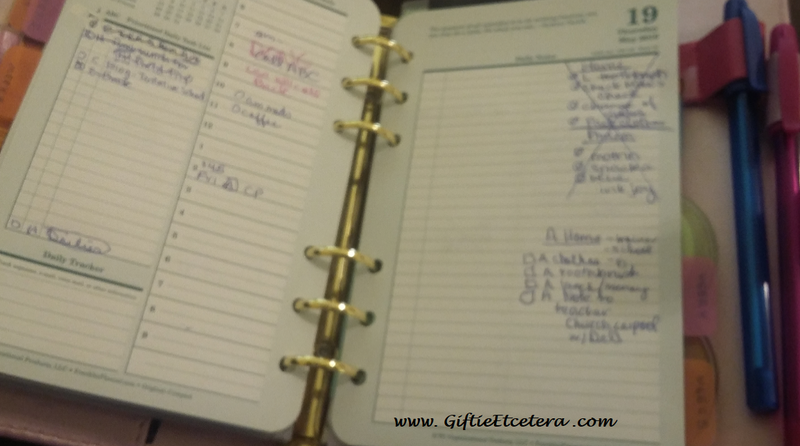 I use the small A-Z section in my pocket Malden to track dr. visits, keep list of hubs meds, etc. Now, whether he would know enough to refer to it if ever I was incapacitated - that's yet to be seen! Oh my goodness, you and your family have been through the ringer! What a great example of the importance of staying organized not only for the everyday, but for those times when life gets out of control. You and your son are in my prayers for a swift recovery. I'm sorry about what happened! I hope you and Locki are well now? I haven't read your blog for some time, and noticed you have a new planner- maybe you will make a post and video about it? Thank goodness you and your son and entire family got through all of that in one piece. I'm sorry all that happened and hope you and your son feel better soon. Thank you for the post, which really is food for thought. I'm glad that you made it to the other side of the crisis and you are on the way to recovery. Hang in there! This does prove the point that the time to prepare for crisis is BEFORE. Once you are in the crisis, you are limited in what you can do and how clearly you can think. I'm somewhat prepared for things like this, but I can do better. So glad to hear that you and your son are doing better. Sending prayers and hugs your way. And glad you shared your story about how your planner saved everyone headaches. This is so true! My husband passed away very suddenly and unexpectedly (he was 30) right before Christmas. We have a daughter who just turned 13 and I hadn't even finished the Christmas shopping yet when it happened. We're living abroad, so we immediately had tons of stuff to arrange. Fortunately, my family was able to come out and help for a little while. My planner is the only reason anything got done in those first few weeks. I literally couldn't function. 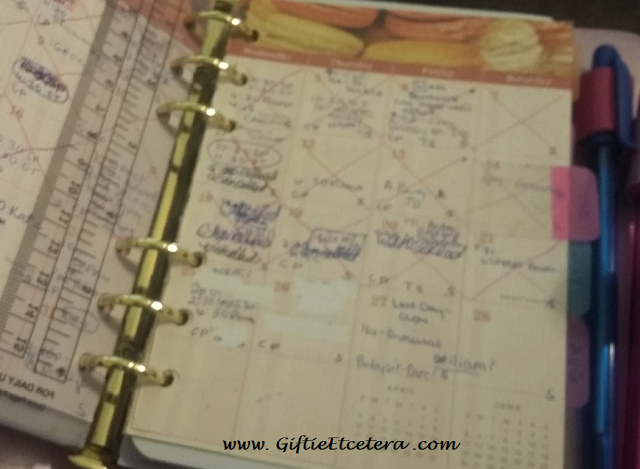 My mom, sister, and even neighbours were able to open my planner and see what needed to get done, contact information for my daughter's school, Christmas menu, schedule appointments (and re-schedule existing ones). I'm sure we would have figured something out for Christmas if I didn't have all those notes already written down, but it certainly made it easier. Being in the habit of writing things down all the time means that I can also remind myself that I really am doing better now than I was then, even though it doesn't always feel like it. My planner has definitely saved me in a lot of ways the last few months! I also wanted to add that I'm so happy to hear you're both on the mend! It sounds like a terrible week. I'll be keeping you in my thoughts and prayers. Glad things are looking better. prayers to you and your family! I think it is critical to have a paper planner vs digital for the reasons you listed. In 2008, my husband became very ill and was sent to the ICU with pnuemonia. I had everything on a Palm and just a few phone numbers on my prepaid cell phone. The charger for my Palm was back at the office and I didn't get it until I went back to work. It died pretty quickly. When you are dealing with someone in the ICU, it's just crazy. I had to work around the problems of being unable to access my information. My husband died from his illness and I had to deal with all the issues surrounding that. I've gone back to paper as a result. If someone insists on keeping everything on their phone, they should at least have a paper printout of important phone numbers. I've talked to people that lost their phone and lost all those numbers as a result. Digital can be nice, but it really isn't as reliable as paper. Oh my God, what a terrible time you must have had. It's good to know that you're both better. I hope you and your little one recover soon. This is an excellent post on the importance of keeping things in a certain order for people to access in an emergency, be it in a planner or anywhere else.